Liam Cameron wants to put his Commonwealth title on the line - in the hope he can add the British belt to his collection. 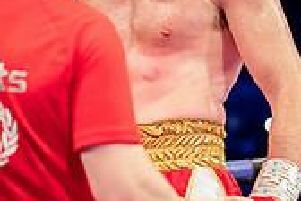 Promoter Dennis Hobson is hoping to organise a ‘winner takes all’ clash between Sheffield’s reigning middleweight champion and Jason Welborn, who has just won the Lonsdale belt. Midlander Welborn, upset the odds by beating former British kingpin Tommy Langford earlier this month. “I think Tommy and his team thought it was just going to be a routine defence against Welborn” said Hobson. “We’ve wanted to do Langford v Cameron for a while now but they’ve avoided it. “Liam stopped Tommy in the amateurs and they haven’t wanted to know. “They’ve done that defence against Welborn thinking they’ll then vacate and move on to the European title but obviously he’s come unstuck. “I think Welborn is similar to Liam in that he’s had some losses but those experiences have improved him. “A fight against Welborn is one we’d definitely like to get involved in, or even Langford if he fancied a pop at the Commonwealth” said Hobson. “We’d be happy to fight either, but Welborn would be great and we could put both titles on the line. “It would be a great fight. “We’re up for it and it’s just a case of getting around a table with people being sensible, and hopefully we can get it on and have another great night of boxing” added the promoter.